Hannah Stadler is a Marriage and Family Therapist who is passionate about helping people “live their best lives.” Hannah is dedicated to working collaboratively with clients to improve communication skills, to learn better coping skills, and to find strategies that reduce relational and emotional distress. 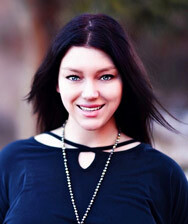 She enjoys working with children, adolescents, adults, families, and couples. Hannah encourages clients to come to therapy with an open mind and willingness to adapt, so that together, they can make changes. She excels at helping clients identify feelings that are related to unwanted behaviors and actions. Hannah provides education and tools for change that are tailored uniquely to each client, while supporting and guiding them on a process of self-exploration. Hannah’s approach is rooted in compassion, connection and acceptance of each client as an individual. Ultimately, Hannah believes that self-compassion, mindfulness, readiness to change and living in alignment with our core values are the foundations for long lasting recovery and wellness. Hannah completed her graduate degree and training, a Master’s of Marriage and Family Therapy, through Capella University. She currently holds her associate license as a Marriage and Family Therapist (MFT), in the state of Wisconsin and is working towards full licensure. Hannah is a member of The American Association of Marriage and Family Therapy (AAMFT) and regularly attends supervision and trainings to stay current in her scope of practice. Most recently, Hannah completed a clinical internship at Power for Change LLC, an in-home intensive therapy program supporting children, teens, and families through a variety of diagnoses. Hannah’s experience encompasses work with families and individuals that struggle with relationship challenges, divorce, behavioral and parenting issues/blended families, trauma, anxiety, and depression. Hannah has worked in a variety of clinical settings that include: Genesee Community Services (in-home ABA Autism therapy), Genesee Lake School (residential facility), and Power for Change (in-home intensive family therapy). She has also volunteered at several private practice counseling agencies over the past few years. These experiences have further developed and enhanced Hannah’s knowledge of self-exploration and counseling techniques to make her an extremely effective and well-rounded clinician. Hannah encourages clients to come to therapy with an open mind and willingness to adapt, so that together, they can make changes.